Traveling to Ocracoke Island this summer, I lugged a handful of heavy books around in my carry-on for about a week. It was great to have the chance to re-read Stephen King's On Writing, plus a few other books, but fairly backbreaking to tote these volumes everywhere. Now I see a product that hints at the future for book lovers. It's the Kindle, Amazon's new reading device. 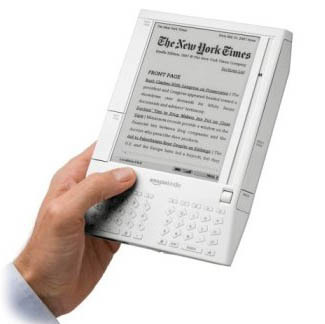 Wireless, with an "electronic paper display" screen, it enables readers to access books via one lightweight device. Free sample chapters are accessible via the Kindle, as well, so that you can peruse as you would in the bookstore. Not being an early adopter, I won't be buying one yet. But future generations of this product will significantly change the way many of us we buy and read books. Will the bookstore eventually go the way of the music store? I for one would miss the thrill of stepping into a vast, soothing, book-lined space with the familiar welcoming coffee aroma.